I would like all of you, to share in my endeavours at creative writing; to journey with me along the path to eventual publication. I write because I love the freedom that writing offers. Like many, I am tired of the constraints of what is known and wish to explore the universe with different eyes. It would bring me great pleasure if I can spread joy to others on my quest to fill my mind with all that I can imagine. This is an award free blog. Your presence and comments are more than enough. I hope that what I write will not offend anyone. If it does, I apologize profusely as it is not my intention to do so. I am embarking on a period of exploration with words and hope what I produce will be stimulating and different . From time to time, I will post extracts from my writings. I am currently working on several pieces; I am close to completing my first young children’s book “Ringu and the Warfoo King.” With some help, I will also do the illustrations. Drawing is another of my hobbies. 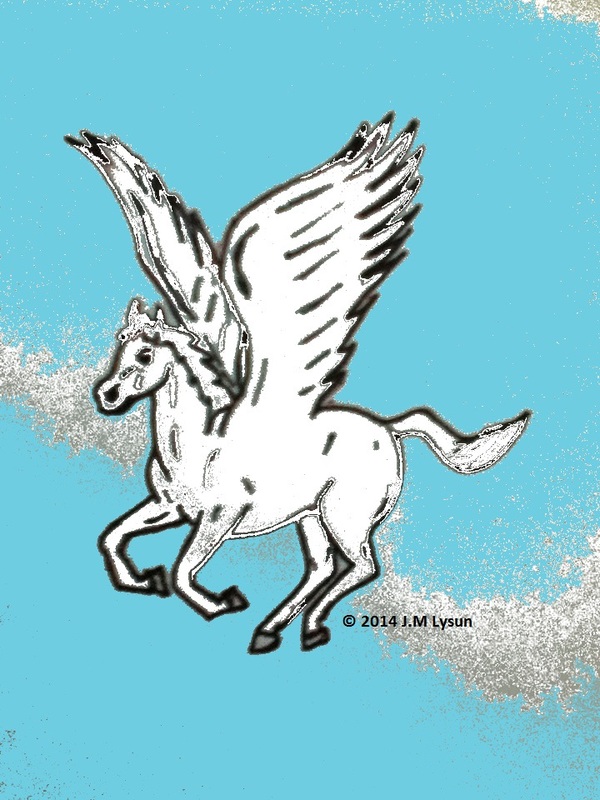 I have created my own hand-drawn avatar, a Pegasus, which during the Renaissance was a symbol of poetry and in later years seen as source of inspiration for all poets. When I feel a bit overwhelmed , I take a deep breath and search for the wisdom of others to guide me. Most of the images come from the public source on the internet. If I have infringed on anyone’s copyright, please let me know and I will remove the images immediately. Thank you so much for this. I loved hearing about what you’re doing/have ben doing. And thank you for sharing such wonderful quotes, the new-to-me info about the Pegasus plus the fact that you drew him! Following you is a great pleasure. Love your blog. Look forward to future visits. Thanks for dropping by my blog! I look forward to reading yours. I love your use of Pegasus. One of my favorite mythological characters–thanks for taking me back. Thanks for liking my travel blog. Wishing you lots of good luck with your writing. You are already doing a great job. Lovely blog and I loved your sentiments on why you write. Hope you don’t mind, I borrowed a few of your quotes. Thank you for stopping by the Cow Pasture and I’m thrilled you decided to jump the fence to stay awhile. I look forward to hearing more from you in the future. No probs, everyone does something like this once in a while! Thanks for visiting my blog and liking my post ‘Purge your heart and mind’. I’ll read your posts soon. I enjoyed my visit and I am happy you are reading my posts! :)! Good luck with your young children’s book and by the looks of it, you will enjoy working on the illustration too! I know what you mean. I’m only on Draft 2 but I already struggle to push it forward. I love the Oscar Wilde quote. He may have been a wiseass, but he was a wise one. Great site. Thanks for visiting my blog. Hope you stop by again soon. Good luck on your journey! It’s a great idea to blog about it. I have been doing so on my blog as well, under “My Publishing Journey,” and have received so many comments from aspiring writers. I also interview other authors to give another perspective. We have to support one another and believe in our dreams! My favorite quote is Fredrich Nietzsche…there are no facts only perception. .. I think it lends freedom to creative expression for writers so carry on! Thanks so much for stopping by my site and for following. I am honored and look forward to seeing more on your site as well. Blessings to you! Kam would like to say he loves your Pegasus, he spotted it on your gravatar. Now he likes your blog! Sorry just seen that on this post. New to your blog & wanted to share the awesomeness. Blessings to you. Good morning: Just had a visit with you on your wonderful website. Enjoyed myself very much and look forward to following. Oh I love these quotes so much!! I have another WordPress blog for my Commonplace Book, which is someone’s personal collection of quotes that have inspired them, made them laugh or made them think about the world in new ways. My Commonplace Book has been ongoing for almost 50 years since I started writing down quotes, etc., in junior high school. May I requote some of yours on my Commonplace Book blog and of course I will attribute that I found them on your WordPress blog? If you’d like to check out my other blog to see if you would like me to requote them there, here is the link: http://www.jeneanebehme.wordpress.com. I would be honoured to have my work posted on your blog. Wow, 50 years of collecting quotes…just been blogging for over a year and I find it tough at times to keep going. Ha!ha! Thanks for the 🙂 on my post! I enjoyed reading a little about you and look forward to reading more of your creative work! The quotes you listed are so powerful!